A bold choice in replaceable handles for your ceremonial scissors, this Royal Blue Ceremonial Scissor Handles will make for some interesting color combinations at your next event. The handles are compatible our 25 inch ribbon cutting scissors. Scissor blades, screws and bolts are not included with your purchase as they are included with the actual scissors. Ribbon cutting events are an important part of grand opening ceremonies as they mark the official initiation of a business or project. With the opportunities presented by these ceremonies when it comes to brand building, special attention must be paid to the aesthetic element. Accessories such as ribbons and ribbon cutting scissors provide that option, and when paired with the right colors, can also make for a visually memorable event. The Royal Blue Ceremonial Scissors Handles is unquestionably one such accessory that you need for the same. 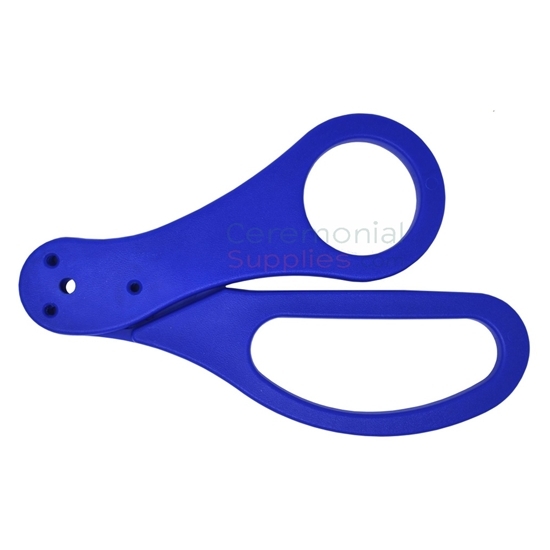 The handle is made of strong PVC material and it comes in a perpetually appealing royal blue color. The handle is designed to be compatible with our 25 inch ribbon cutting scissors for a creative colorful pairing. More color options can be found in the ribbon cutting scissor handles section of CeremonialSupplies.com.